Sophie Cruz letter to Pope Francis: Activist groups including Full Rights for Immigrants Coalition planned the stunt. Pope Francis greets Sophie after she ran towards him during a parade in Washington D.C, United States on September 23, 2015. By Wednesday afternoon, everyone knew the name of the little girl in braids. 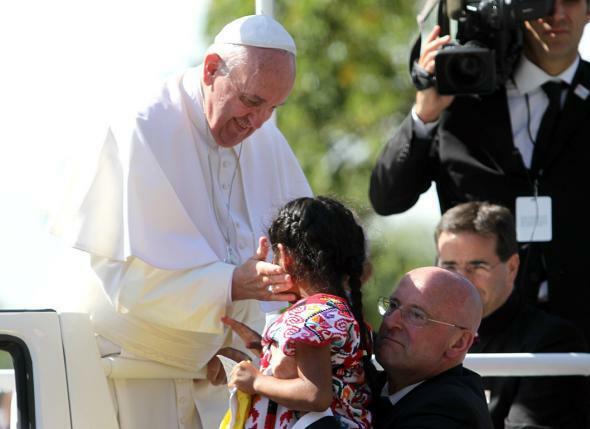 By thwarting the papal security entourage, capturing His Holiness’s attention, and bounding up to hand him a gift and a hand-written letter, five-year-old Sophie Cruz had endeared herself to the nation. In response to her seemingly spontaneous gesture, the pope bestowed upon her a blessing and a kiss. Members of the coalition had traveled to Washington with Sophie and her father, Raul Cruz, a 36-year-old undocumented immigrant. If Sophie hadn’t been successful in Washington, they would have shuttled her to New York and then Philadelphia to try again. But she fulfilled her mission, presenting the pope with an impressively eloquent letter that began with the words, “I want to tell you that my heart is sad” and went on to intercede on behalf of the rights of immigrants and their children. “I have a right to live with my parents. I have a right to be happy. My dad works very hard in a factory galvanizing metals. Immigrants like my dad feed this country,” she told reporters. Gutierrez insists that Sophie crafted her own letter, and that she wasn’t told what to say to reporters afterwards. “She didn’t have anyone coaching her,” Gutierrez told the AP. “She just spoke from her heart. It all came from her.” Cruz also gave the pope a yellow t-shirt with a message in Spanish asking Francis to “rescue DAPA,” Obama’s now-stalled program Deferred Action for Parents of Americans and Legal Permanent Residents, which if passed would let millions of undocumented immigrants to apply for permission to legally stay and work in the United States. Sophie’s appeal to the pope was clearly meant to draw heartstrings. But just because it was a stunt, that doesn’t mean her message isn’t genuine. Her cause is one that this pope is receptive to: On Thursday, Pope Francis made a nearly hour-long speech before Congress calling for the U.S. to display greater openness to immigrants as well as refugees. He began by showing his solidarity with the plight of immigrants, acknowledging that he himself is the son of Italian immigrants to Argentina. “As the son of an immigrant family, I am happy to be a guest in this country, which was largely built by such families,” he said. An attorney who supports the coalition told Telemundo that it was hoping the pope’s address would “soften some hearts” when it comes to immigration reform. It remains to be seen whether any were softened.